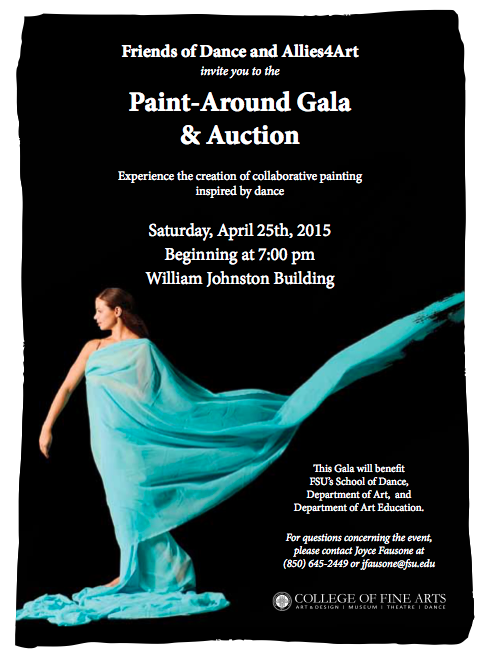 Join us on Saturday, April 25th, to supporting Florida State University’s Departments of Art, Art Education and School of Dance as we present the 2015 Paint Around Gala & Auction. This event, benefitting and highlighting all realms of Art at FSU, will take place Saturday, April 25th, 2015 @7PM-9PM, in the William Johnston Building. The Paint Around Gala & Auction will consist of multiple artists figure painting dancers in pose. A jazz trio will accompany the artists, as they rotate around the centerpiece, giving new contributions to their fellow artists as they rotate. Guests are welcome to walk around the painters and closely follow their technique.